For the longest time, a small Yunnanese operation worked its magic out of this location and was very popular amongst the local community and food travelers. 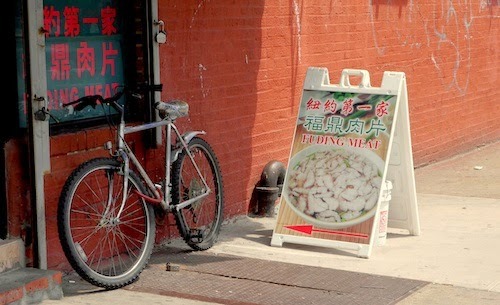 That eventually moved down the street and the shop became its next iteration, offering "Fuding meat," a seemingly unique addition to the area. 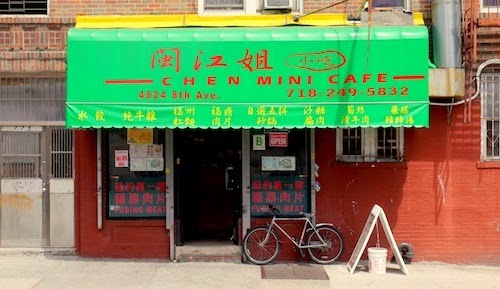 After a name and address change (even though the shop has not moved), the current Chen Mini Cafe carries on offering foods from the northern reaches of Fujian province. There are a few photographs inside and out of their specialty, the aforementioned soup, none of which look appetizing and take a good leap of faith to order for the uninitiated. 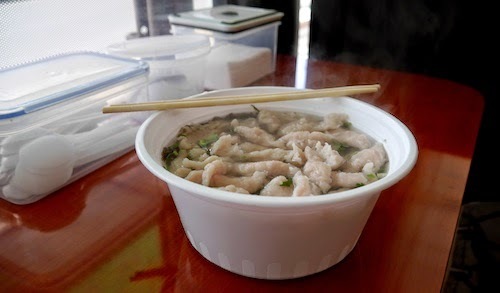 A quick journey to the internet shows that Fuding is simply a coastal city near the border with Zhejiang Province, and not some kind of bug, so I ordered myself a bowl ($5, below). The meat has the texture of a thick noodle, slightly less dense than a fish ball but very similar. The amount of food here appears to be more than it is, as the meat floats on a broth that consists of just some seaweed and cilantro underneath. I added some of the chili sauce on the counter to give the soup a kick, and the lady running the place came over after I had finished half to make sure I liked it, an interesting touch not usually seen at a place like this. I found one pickled vegetable in the broth, which came as a complete surprise, but very welcomed. I searched for more without reward. Just like its predecessor, Chen still gets a steady flow of eaters that come in and leave in about five minutes, slurping their soups quickly and getting back to their lives.